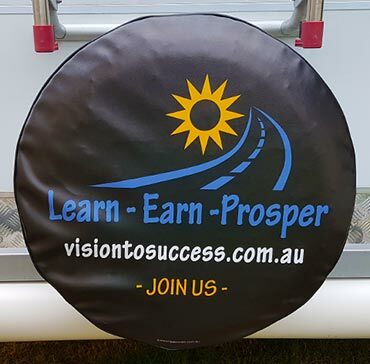 Spare Tyre Covers custom made for your caravan, camper or SUV. 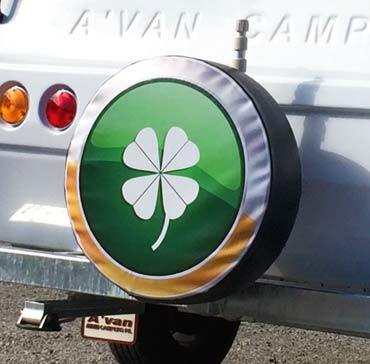 Our caravan spare wheel covers are made from high quality marine grade vinyl. We custom size your cover to suit your caravan spare tyre, which gives a superior look compared to generic sized tyre covers. Choose from plain colours, one of our stock designs or a custom designed cover. Plain Colours > Choose from either black, white or mid grey plain coloured spare tyre covers. Our Designs > We have many stock designs for caravan spare wheel coversto suit all tastes and styles. Custom Design > Want your own photo, wording or image. Contact us and we can help put together your ideas into a custom designed spare tyre cover. You can conveniently order or enquire online using the links above or please feel free to contact us to discuss your spare wheel cover options. All our spare wheel covers are custom made to suit your tyre code. This ensures a perfect fit that enhances the look of your caravan or camper. Made from high quality UV resistant marine grade vinyls you can be assured they will look great and last the harsh Aussie elements. Your cover comes with piping as standard which further enhances the look and increases the durability of them. We produce custom covers in larger bulk orders for Caravan, Campers and SUV dealers. Please see more info at our bulk order spare wheel covers page. Please feel free to contact us for your caravan spare tyre cover.